I try to convince myself that there are some good things about end of the summer…that the light is more subtle in autumn, that you don’t have to water the garden, that there are new soup recipes to look forward to. Blah blah blah. The fact is there is no season I like more than spring because of the promise of summer that comes with it. Anyway, it is now well and truly autumn and that means quinces. I often serve a cheese board with extras like fresh figs, crunchy pear and, of course, home made quince paste. What I love about making quince paste is that you don’t have to peel or core the fruit. Just chop it up, cover with water and a squeeze of lemon and cook until soft. Puree the fruit and sieve. 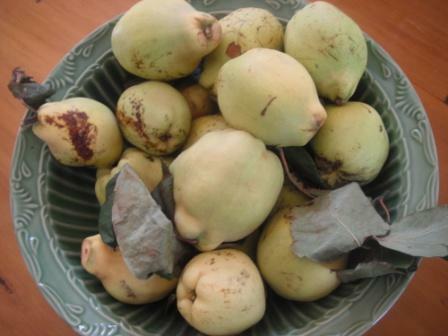 Put a cup of sugar for every cup of quince puree in a pan and boil until thick and pink.